I made this box in May, but I couldn`t show it before now. 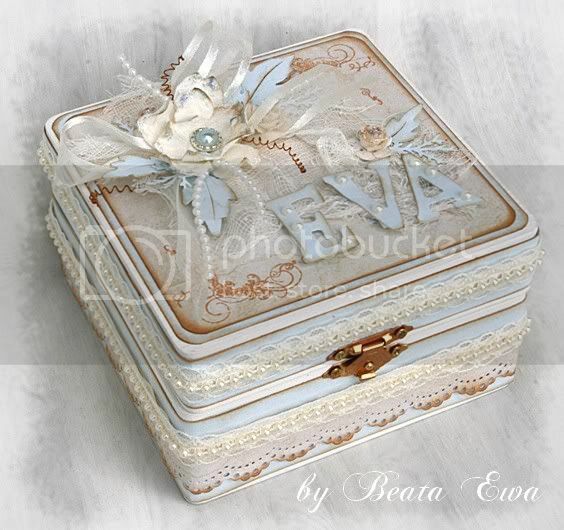 I painted an old wooden box with white acrylic paint and decorated it with pale blue and beige paper, muslin, ribbons, flowers and pearls. I coloured the metal fastener to match the project using alkohol ink. Du gör såååå vackra alster, helt otroliga. Stunningly beautiful and worth the wait to see it!! Nydelig, simpelthen bare helt nydelig. Denne fargekombinasjonen er utrolig delikat. zakochałam się w Twoim pudełku! cudowne jest, takie idealne. What a wonderful box! I love it- really great creation you show us! Vanvittig lekker. Rett og slett nyyydelig!!!! Wow, hvor er den flot. Du tryller da også det ene smukke ud af ærmet efter den anden! Ojej, ale cacucho popełniłaś! Przecudne! Så nydelig boks du har laget! Utrolig vakkert pyntet, og så fine farger! WOW Beate what a stunning work. Wowwwwww this is sooooo beautifull I love it !! this is such a beautiful box. i love the ribbon with the pearls and the colors . Ohhhhhhhh så lekkert Beata,herlige lyse farger. Wow, soooo beautiful!! Great job!! Flott shabby stil og stemning over denne!